I complain about it from time to time, but I like being an adult. I like doing adult things — like buying and eating ice cream whenever I want to (and getting to choose the flavor, too — bliss!). Or going on road trips whenever and wherever I want to (and not having to sit in the back seat with my brothers who insist on turning it into a jungle gym/wrestling mat/place to throw around their smelly socks). Or doing my own hair and wearing whatever clothes I want to wear and paying taxes. Oh wait. Or, making beer bread and drinking the leftovers. Yes. Being an adult is (mostly) swell. Ever since my mom used to make that beer bread that comes from a box, I’ve been a fan of the stuff. I love its naturally yeasty flavor, and I love that the outside bakes up all crusty-like but the inside is a soft crumb. And I especially love when I can add things to it like fresh rosemary and shredded Gruyere cheese — you know, fancy adult things like that. The thing about this beer bread is that it’s got serious oomph in the flavor department. I used a locally brewed black ale which gave the bread a real (read: crazy good) depth of boozy flavor, but the creamy, savory tones of the cheese combined with the herbal freshness of rosemary offset any bitterness rendered by the beer. If you’re not the greatest fan of dark beer, you can swap it out for a lighter lager. You can also add other stuff to the bread, too, like bacon, or swap the Gruyere for gouda. Just be sure to always, always top it with melted butter. Because, I mean, it’s a Fritz Bernaise, ladies… I don’t think there’s a question. It’s pretty much what I love most about this bread. I also love that it takes about, oh, five minutes to mix together and pour into a pan. It gives me more time to do adult things, like clean the shower or pay my taxes. Oy. I’m going out to get ice cream. P.S. Did you know beer bread makes scrumdiddlyumptious croutons*? Well, it does. Especially on top of one of my favorite soups. 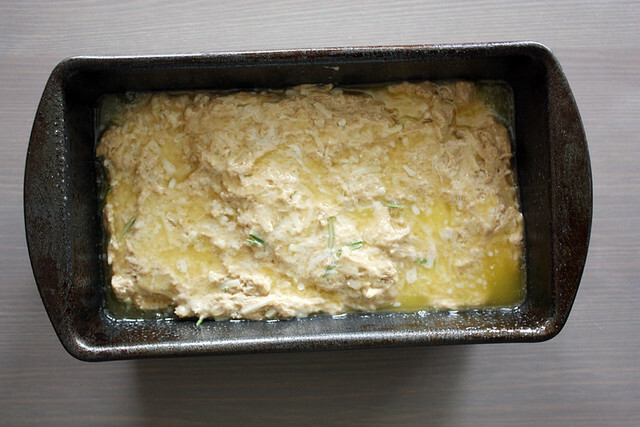 Heat oven to 375 degrees F. Lightly grease a 9-by-5-inch loaf pan; set aside. In a large bowl, whisk flour, sugar, baking powder and salt to combine. Add beer; stir until just combined. Fold in Gruyere cheese and rosemary. Pour batter into prepared pan; smooth top. Pour melted butter evenly over top of bread. Bake until golden brown and a toothpick inserted in the center comes out clean, about 45 minutes. Cool in pan 10 minutes; remove from pan and cool completely on a cooling rack before serving. *To make beer bread croutons: Heat oven to 400 degrees F. Cut leftover or day-old beer bread into 1-inch cubes and place on a rimmed baking sheet. Drizzle lightly with olive oil, then sprinkle a little salt and pepper on top; toss to coat. Toast in oven until edges are a deep golden brown, about 10-15 minutes, flipping once during baking. Cool slightly. I adore this, Stephanie! I just made classic beer bread this weekend. We love it so much that I can never stray from the norm. This however, may convince me! I mean this bread. I just die. 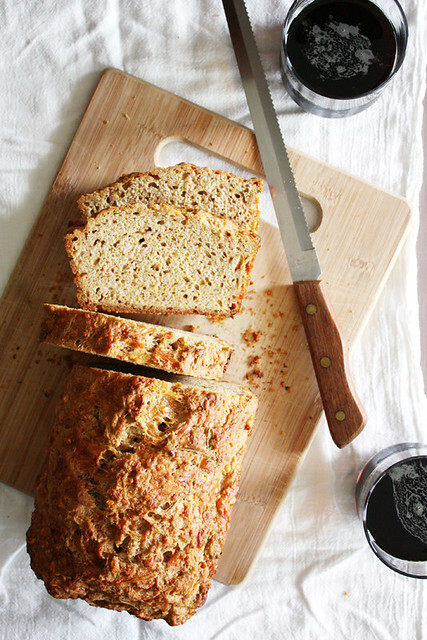 Such a great flavour combination – this bread looks so tasty! Cassie — I know what you mean! This was my first time straying and I think there’s no going back. 🙂 Thanks for the comment! Kathryn — Thanks so much, dear! Beer bread is the best! So simple and comes out great every time. Yours looks so good – can’t go wrong with gruyere! Oh dear me – I haven’t made beer bread in forever! The croutons?! OMG!!! 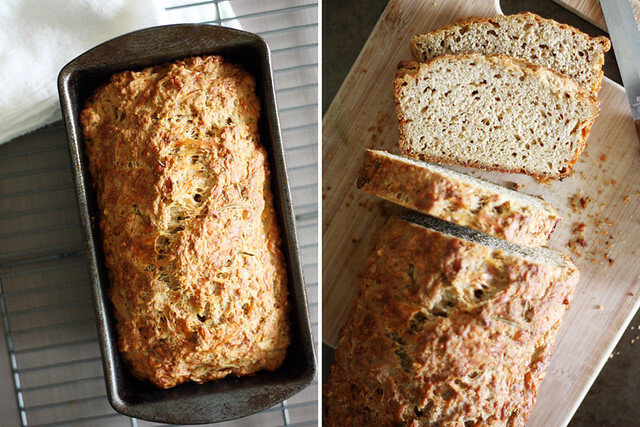 Ooooooh….I have never made beer bread before! This looks amazing, Stephanie! And I adore the crouton touch!! Little Kitchie — I love that it’s so simple to make (sometimes dangerously so… ;)) Thanks for the comment! Lauren — You should totally try it! It’s ridiculously easy and delicious, if I say so myself. 🙂 Thanks for the comment! I need this bread in my life! Rosemary and gruyere are two of my favorite things! Oh my goodness…this sounds phenomenal! I love beer bread, and adding cheese and rosemary is genius. Pinned! 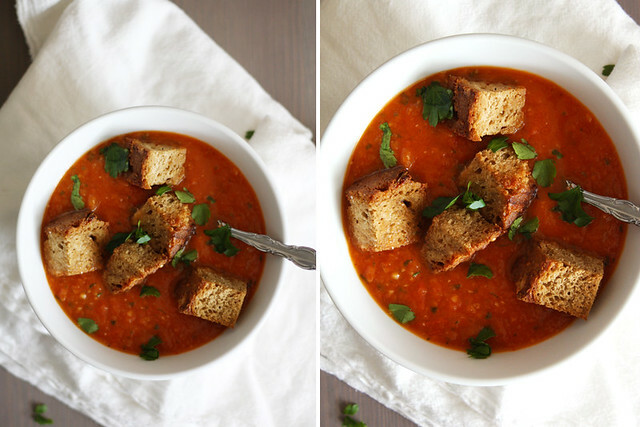 I have all the ingredients in the fridge to make this right now! Hello Beer Bread for breakfast, nice to meet ya. Katrina — Why thank you, dear! Nicole — Well then it is a sign from above — you must make it. 🙂 Thanks for the comment! What a beautiful loaf of bread! I always scarf down beer bread whenever I visit a certain friend who is famous for her recipe. I need to try this one now! Thank you for sharing. A lovely post to go along with my latte and cinnamon raisin bread. I hope you have a beautiful week! Monet — Thank you so much! Hope you like it. 🙂 Have a great week, too! Looks delicious! I definitely spot melted butter 🙂 I totally agree, most aspects of adulthood are great. I sometimes randomly think about things like the fact that for 16 years of my life, I had to rely on my parents to drive me everywhere and I can’t even imagine going back to those years, haha. Laura — No. Joke. Glad those years are over. 🙂 Thanks for the comment! I am in love with this bread! I love the flavors in this bread!! Gruyere has got to be one of my favorite cheeses and paired up with rosemary & beer IN a bread? To die for, girl! Beer bread is a serious benefit of adult life. Yours looks fantastic! Jen — Thank you so much! Stephanie, you are a bread PRO! This beer bread sounds fabulous! You had me at Gruyere! Oh Stephanie! I really do need this bread in my life! Really! Baking Serendipity — It really is. 🙂 Thank you! Robyn — And you can HAVE this bread in your life! 😉 Thank you! I think that rosemary in bread is one of the best things ever and with the gruyere in it I bet it is just amazing. Can’t wait to try it out soon. Julia — I love me some rosemary in bread, too — and I have to say, the gruyere really makes it extra magical. 🙂 Thanks for the comment! i made norwegian rye/beer bread this weekend. but cheese & beer? obviously a great combo. oh my heavens… GIMME-GIMME!! All the flavors in this sounds too good to be true! Gruyere is my life! Laurie — I hear you: Gruyere is totally my life, too! 🙂 Thanks for the comment! I agree with your sentiment on being an adult. My mother’s told me that when I was a child, I would often wish I was an adult so that I could eat cake any time I wanted! I love the nuttiness and distinct flavor of gruyere. I think it pairs beautifully with the rosemary and beer. Wonderful post! Mari — Lol, I love that! Eating cake any time we want is a bonus of adulthood, that’s for sure. 🙂 Thanks for the comment! I love your grown up spin on beer bread that far too often is just plain ol’ beer and cheddar. 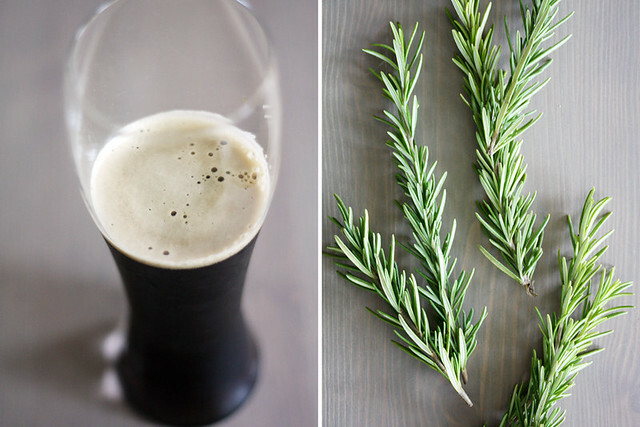 I adore the addition of fresh herbs and dark ale. Gorgeous! And I bet those croutons are ridiculously good. Mmm mmm mmm! Julie — This is definitely the perfect recipe to start with once you decide to make your own bread (which you totally should! It’s not that scary! :)). Thanks for the comment! oh my goodness Stephanie! I LOVE this bread! so beautiful and I bet it tastes wonderful. . I love Gruyere cheese and rosemary! I made it a couple of days ago with rosemary and cheddar (that’s what i had in my fridge) and out came out incredibly delicious! It was my first time to make beer bread and I will definitely be making it once a week. Great recipe, thanks! I love this recipe. I make it often!! Thanks so much for sharing it! I was wondering if you’ve made this bread into muffins. If so, did you adjust the temp? And how long would you recommend baking them for? Sandy — I have not made this into muffins before, but it would work! I would bake them in greased muffin tins or paper baking cups at 350 until a toothpick inserted in the center comes out clean (not sure how long that would be…). Let me know if you try it!